We’re excited to announce our 20th Edition Dallas-Fort Worth Salary Guide! Are you looking to hire and want to ensure your compensation levels position your company as an employer of choice? Do you know the latest trends and forecasting in the Accounting, Finance, and Tax sectors? 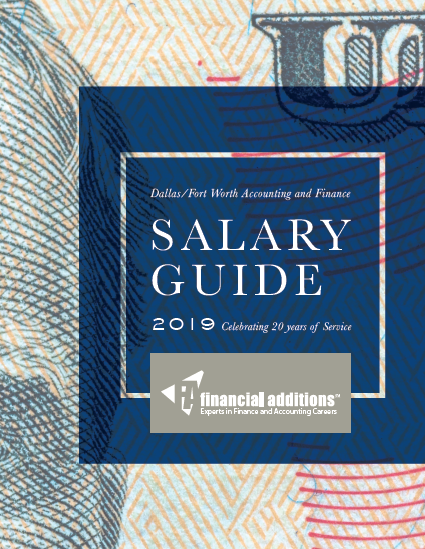 For the past 20 years Financial Additions surveys our clients, candidates, job orders, and salary history data to develop a Finance and Accounting Salary Guide focused solely on the Dallas-Fort Worth market. We are pleased to announce that our 20th Edition 2019 Salary Guides are hot off the press and we have free copies available. Reach out to us to request a copy! ⟵Thank you to our Amazing Clients and Candidates!